NOTE - This is the longest post in Real Life LEED history. You may groan at the thought of reading the text below, but I assure you it's a much quicker way to get up to speed with the changes in the new LEED 2009 systems then reading through the new reference guide as I did. Man up, read the following, and sound smart around your colleagues. Back to the reference guides... There are two versions available - a hard-copy that comes with 30-day access to a non-printable PDF, and an 'e-book' version that is a printable PDF for $10 less. Both can be downloaded and saved. I opted for the e-book version, and I imagine most will do the same. Amazingly, you have to pay shipping for either copy? And just in case you forget the copyright agreement you agreed to with the E-book don't worry, it's watermarked on EVERY FREAKIN' PAGE of the reference guide. Though I've not worked with the material yet, it appears that there are more detailed examples and many more helpful tables, charts, and graphs. In general it seems like this guide is more user-friendly. A last bit of good news is that the entire guide is a single file instead of being annoyingly split into the different categories as was done previously. Some bad news... the new Green Building Design and Construction Reference Guide, 2009 Edition clocks in at a whopping 674 pages, but some supremely good news is that they combined the LEED-Schools, LEED-NC, and LEED-CS guides all into one, saving you money. LEED for Healthcare and LEED for Retail will be included, but as they're still in pilot they aren't at this time. LEED-CI and LEED-EB still get their own reference guides... Every credit for every system is listed in order, and depending on which system you're using you can simply ignore what doesn't apply. Yep, though there was no problem paying for the new reference guides on Friday, I couldn't actually download them until Saturday morning. I've tried to be understanding about whoever the IT staff at USGBC and GBCI, but if the new LEED-Online launch is similarly poor then management should strongly consider either increasing funding for this or warming up the ol' pink slip machine... Luckily it's really rainy here in Charleston on this lovely Saturday so I have nothing better to do than read a reference guide and report the findings to you! I'm not going to repeat what I've already covered before, so if you haven't read my initial review of the 2009 draft you may want to now. In general, I'm more knowledgable about LEED-NC than either LEED-CS or LEED for Schools, so it's very likely I may have missed a few differences between the current and new versions of those... Off we go! Must be a Building - States that the project must "include the new, ground-up design & construction or major renovation of at least one building in its entirety." This also forces multiple buildings within a "single construction contract and ownership... within the boundary of a contiguous area" to be handled under a single certification. I'm currently working on a set of buildings that would not be in compliance with this requirement. Finally, there is an interesting clause that states that projects must be built "on already existing land"... I guess no LEED v3 certifications on Dubai's artificial beaches! Must Use a Reasonable Site Boundary - There are a lot of clauses in here that sound strict at first but generally allow for loopholes based on special circumstances. Must Comply with Minimum FTE and Floor Area Requirements - This is new... If the project has less than 1 FTE than it is no longer eligible for Indoor Environmental Quality points, though you still must comply with prerequisites. For LEED-NC the project must have at least 1,000 gsf of "indoor, enclosed building floor area". Must Comply with Minimum Occupancy Rates - Applies to LEED-EB only. 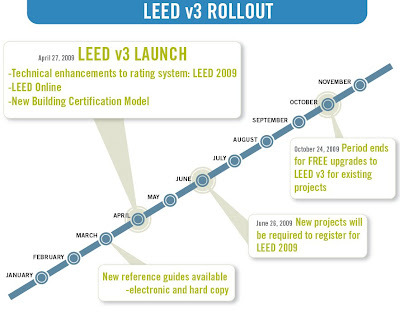 Registration and Certification Activity Must Comply with Reasonable Timetables and Rating System Sunset Dates - Basically states that if a LEED 2009 project is inactive for 4 years, the GBCI reserves the right to cancel the registration, that all paperwork must be finished within 6 years of the retirement of the system (i.e. 2017 for the LEED 2009 system), and that certification must be complete within 2 years of project occupancy. 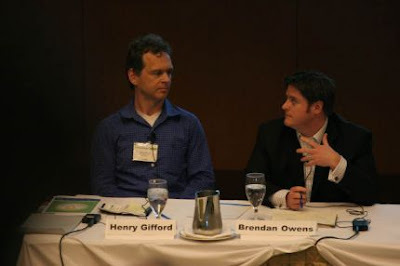 Must Allow USGBC Access to Whole-Building Energy and Water Usage Data - Let's call this one the Henry Gifford clause. The rating will not be tied to the information provided, and the owner does not have to "actively supply USGBC with information, but simply authorize the USGBC to access the information". This is long overdue, and I imagine in the long term will do more to create accurate energy and water modeling standards than anything else to date. Long overdue and a great idea. As to what 'allowing USGBC access' means is yet to be seen. Must Comply with a Minimum Building Area to Site Area Ratio - The project's floor area must be at least 2% of the total site area. I'd be curious to learn the reasoning behind this clause. I suspect it has something to do with the sometimes contrary goals of the development density and maximize open space credits. The regional 'bonus points' mentioned in the first review post are not spelled out in the reference guide in any real detail other than to say that points will be determined automatically in LEED-Online based on zip code, and that "the USGBC website also contains a searchable database of Regional Priority credits" that does not yet exist. EDIT - 04.21.09 - The regional credits have now been released. Find a link to these and my first take on the matter here. Featured in the original LEED-CS reference guides, there are a series of appendices that have been updated and expanded in the current edition. Most notable is a greatly improved default occupancy count list (now featuring 13 building types instead of only 4) that includes both FTE and transient occupancy numbers where applicable. I would suggest many NC projects will benefit from these numbers as well, particularly as they relate to hotels, retail, and restaurants which were previously unavailable. There are also new sections on Tenant Lease or Sales Agreements and Precertification Guidance. Again... this is only the stuff that hasn't been mentioned earlier... Most of the comments below reflect basic clarifications, but a few credits (see SSc5.1 for the first example) have structural changes to the credits that were essentially not voted on during the draft phase. Ditto for the mandatory program requirements covered above. This is my one major problem with the way the drafts are commented on, voted for, and approved. I would argue that having the distinction between the 'rating system' and the 'reference guide' is meaningless, the reference guides ARE the rating system. I would hope future approval processes for LEED will allow for the evaluation of the entire system, not just the first few pages. Basic referenced standards updates (i.e. from a 2004 to a 2007 standard) are not addressed in the comments below. SSp1 - Construction Activity Pollution Prevention (NC, CS, Schools) - Now requires photo documentation, inspection logs, or reports to verify compliance. SSc4.1 - Alternative Transportation, Public Transportation Access (NC, CS, Schools) - The CIR approved exemplary performance option about 'doubling transit ridership' has been formally incorporated into the reference guide. SSc4.2 - Alternative Transportation, Bicycle Storage and Changing Rooms (NC, CS, Schools) - Offers clearer guidance on determining FTE and occupancy counts than previous editions. SSc4.3 - Alternative Transportation--Low-Emitting and Fuel Efficient Vehicles (NC, CS, Schools) - Clearly defines preferred parking via discounts for spaces as at least 20% below the normal price. For NC projects, defines a compliance path option for a low-emitting vehicle sharing program. SSc5.1 - Maximize Open Space (NC, CS, Schools) - In the implementation section, there is a clause that states "if a 10-acre site contains 5 acres of greenfield and 5 acres of previously developed land, site disturbance must be limited in the greenfield area, and native and adapted vegetation must be protected or restored for at least 50% (excluding the building footprint) of the previously developed site area." This seems like it could be pretty confusing and limiting on sites where this occurs. There is also an additional exemplary performance option (also not voted on) that allows credit for restoring 30% of the site including the building footprint OR 75% of the site excluding the building footprint, whichever is greater. SSc8 - Light Pollution Reduction - Lighting zones better clarified. Looks like they forgot to include sports field allowances for schools on page 131... Whoops! The numbers do show up on page 137 though. WEp1 and WEc2 - Water Use Reduction (NC, CS, Schools) - The 20% requirement that was formerly a point is now a prerequisite. Points begin at a 30% reduction and rise up to 45% for exemplary performance. In general there is some helpful information about how the EPA WaterSense program requirements relate to the LEED requirements. EDIT 02/11/10 - I've recently discovered that in addition to adding a prerequisite, the baseline that the design cases are compared to has shifted from 2.2 gpm to .5 gpm for public faucets. This change has been explained in detail in a post called Key Baseline Changes in 2009 Edition of WEc3, Water Use Reduction. WEc4 - Process Water Use Reduction (Schools only) - Nothing major changing here, but I must wonder why this hasn't be adopted to fit into NC and CS projects? Again I blame the limited means of commenting and adapting drafts of rating systems. A literal (fire) stairway to heaven? EAp1 (EAc3) - Fundamental (Enhanced) Commissioning of Building Energy Systems (NC, CS, and Schools) - Provides much greater detail of step-by-step process for moving through owner's project requirements, basis of design, and commissioning coordination as well as greater detail about who is and is not allowed to act as the commissioning authority, though none of these requirements are new as far as I can tell. EAc2 - On-Site Renewable Energy (NC, CS, and Schools) - This credit now offers regular points generating as little as 1% and as much as 13% of the power needed by the building (exemplary performance is set at 15%). There is also a clause that clearly forbids including energy that is generated but not used or energy that is to be sold back to the grid (presumably via net-metering). Furthermore, the owner can not sell Renewable Energy Credits (RECs) for the power they are claiming as part of calculations. This language is not in the v2 reference guides, though there may have been a CIR related to the subject already in effect that I'm not aware of. There is also a documentation requirement in regards to "any incentives that were provided to support the installation of on-site renewable energy systems." EAc5.2 - Measurement and Verification--Tenant Submetering (CS only) - In addition to v2 requirements, the project team must "[p]rovide a process for corrective action if the results of the M&V plan indicate that energy savings are not being achieved." This edition of the reference guide finally references MasterFormat 2004 in it's definitions of what is and is not included in the qualified materials figures for MRc3-7. Instead of the 1997 divisions 2-10 definition, they now cite 2004 divisions 3-10, 31.6, 32.1, 32.3, and 32.9. Division 12 (furniture and furnishings) is still optional. MRp1 - Storage and Collection of Recyclables (NC, CS, and Schools) - Clearly indicates that "it may be possible to create a central collection area that is outside of the building footprint or project site boundary" if you can "document how the recyclable materials will be transported to the separate collection area." This was allowed previously as evidenced by CIR's but caused confusion among many. MRc1.1 - Building Reuse--Maintain Existing Walls, Floors, and Roof (NC, CS, and Schools) - Due to additional points being assigned to these credits, the thresholds for achievement have changed. 55%-95% for NC, 25-75 for CS, and 75-95 for Schools. Only CS has an exemplary performance option at 95%. MRc5 - Regional Materials (NC, CS, and Schools) - Clarifies 'manufacturing location' as the "place of final assembly of components into the building product that is furnished and installed by the tradeworkers", which is consistent with past CIR's but caused confusion among many. Annoyingly, a later example graphic shows multiple manufacturing locations all being within the circle, making me doubt myself about the certainty of this ruling? 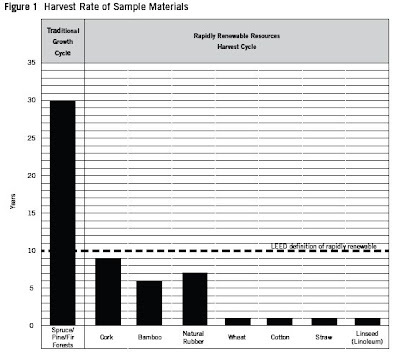 MRc6 - Rapidly Renewable Materials (NC, CS, and Schools) - Now includes a graphic (below - taken from page 389 of the guide) showing how wood is clearly not within the USGBC's definition of rapidly renewable. Take that, lumber-industry shills! Five Fingers to the Face! MRc7 - Certified Wood - Goes into much greater detail about FSC chain-of-custody reporting requirements and how to report them for LEED purposes. EQp3 - Minimum Acoustical Performance (Schools only) - The USGBC has simplified but strengthened the compliance paths for this credit, essentially calling for sound absorptive materials for an are larger than ceiling area. A much more prescriptive approach will make this credit possible to understand and implement by architects, though some guidance will still be needed regarding background noise levels and possibly ANSI Standard S12.60-2002. I would greatly appreciate an acoustician's point of view on the new requirements if you would care to share your thoughts in the comments. EQc4 - Low-Emitting Materials (NC, CS, and Schools) - I'm a bit upset on this one... wasn't a large part of the LEED 2009 system supposed to be credit alignment? The LEED-Schools version still references separate standards than NC and CS?!? No word yet on whether or not the PIECAP ruling for the previous version still applies. A link to a list of LEED-Schools compliant products is available here. Similarly, why aren't the full six options available to NC and CS projects? EQc4.3 - Low-Emitting Materials--Flooring Systems (NC, CS, and Schools) - This was formerly the 'carpet systems' standard, now expanded to included hard surface flooring. The standard carpets remains the same. FloorScore is used for other surfaces, and any stains or sealants on wood or other materials must comply with EQc4.1 requirements. An alternative option is to use products meeting CHiPS requirements. EQc5 - Indoor Chemical and Pollutant Source Control (NC, CS, and Schools) - Those metal grates by your main entries must be 10' long instead of just 6'. Also, there is a new requirement to "provide containment for appropriate disposal of hazardous liquid wastes in places where water and chemical concentrate mixing occurs." There are also additional requirements for separating 'battery banks used to provide temporary back-up power'. EQc7.2 - Thermal Comfort--Verification (NC and Schools) - There is now a clause that state that earning this credit "is contingent on achieving EQc7.1, Thermal Comfort--Design." I checked the old NC reference guide and couldn't find anywhere where this was required. Our projects haven't had any problem achieving 7.1 before, so I can't be sure if this is something I've missed in the past? Again, this seems like a very reasonable clause, but shouldn't it have been part of the draft and not buried in section 4 of the reference guide? EQc8.1 - Daylight and Views--Daylight (NC, CS, and Schools) - This credit has abandoned the 2% daylight factor calculation in favor of one that uses a more simple multiplication of glazing visible transmittance and window to floor area ratio. There are also now maximum footcandle levels (500 fc)if you're using a simulation. There is a clause that rids you of the maximum levels if you "incorporate view-preserving automated shades for glare control." Finally, there is a fourth "combination" option that allows you to use any of the above to document individual compliant spaces. This could be very helpful in a lot of situations where you have a bunch of 'normal' spaces and one or two weird ones (i.e. an atrium spanning multiple floors). EQc8.2 - Daylight and Views--Views (NC, CS, and Schools) - Nothing substantial changed here, though I just wanted to point out that Figure 3 on page 570 isn't technically correct. Every piece of the open plan office should have access to views since they are surrounded on three side by windows. The drawing indicates blind spots along every wall, which is not the case since one could just look out windows along the other wall. Nit-picky? Yes, but I can already see the arguments popping up in offices across the land! EQc9 - Enhanced Acoustical Performance (Schools only) - This was downgraded from up to two points being offered currently to only one in the future. The lower levels of the requirements (min 35 STC between rooms and max 40 dBA background noise) are the ones that made the cut. Option 2 (about HVAC RC levels) was removed entirely. IDc1 - Innovation in Design (NC, CS, and Schools) - Expanded to up to 5 points for NC and CS and remaining at 4 points for Schools, there is now a maximum of 3 points allowed for exemplary performance options. There are more (or perhaps just better clarified?) requirements for what constitutes 'innovation and design' eligibility. After about ten hours invested in this review and post, two months of last-minute LEED AP exam classes, and overall dedication to LEED minutiae, I can safely say I'm going to take a LEED break. 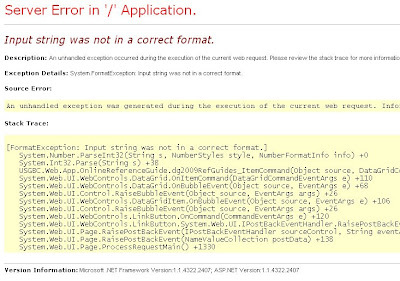 Please point out any errors or omissions from the above posts by leaving a comment... I hope this is helpful! Great post, I'm just taking a read through the new reference guide this morning. So much for bringing the guide with me to meetings . . .
Are you aware of any good resources (maybe similar to your blog) that focus on LEED for Existing Buildings, Operations and Maintenance? This is where my principal focus lies, and I'm very new to LEED having to explain a lot of this to more experienced (and often times skeptical) people. So the new LEED reference guide is expensive AND at one point couldn't even be downloaded due to their server problems... in the same way that documentations could not be submitted to LEED online during the work days due to their server overload. For the money that the USGBC is charging for the reference guide, registering the project etc. they should really offer a more reliable and stable service. I think they have much to learn from the Canonical Foundation, maker and distributor of the Ubuntu Linux operating system. If the USGBC wants to be the evangelists of green, sustainable buildings, they really have to step up in this aspect. I haven't yet downloaded the Reference Guide, but it appears that commercial lavatories went from a baseline of 2.5 gpm to 0.5 gpm. Is that what you are seeing in the reference guide? The referenced ANSI standard (S12.60-2002) establishes acoustic design criteria for schools, to promote a good learning environment (and really it has little to do with sustainability otherwise). In general, the LEED prereq/credit is less demanding than the ANSI standard, which (as an acoustician and a product of some noisy public schools) is a shame, but a good start. By now, most new K-12 projects in the US should be using this standard as an acoustic goal, LEED or not. For reference, the highlights of the ANSI standard itself are a maximum noise level of 35 dBA in core learning spaces, and separation of STC-50 between core learning spaces (higher for certain noisy adjacencies such as music rooms and cafeterias next to classrooms). EQp3: The 45 dBA prerequisite is about twice as loud as the 35 dBA in the referenced standard. EQc9: The wording here is misleading. Windows must meet a rating of STC-35. All other partitions must meet the requirements in the ANSI standard (STC-50 between core learning spaces). STC-35 between classrooms would be woefully inadequate in any school. Background noise is to be 40 dBA or less. Previously, LEED for Schools awarded a second EQc9 point for reaching the 35 dBA required by the ANSI standard; now, this does not even appear. I can say that the 35 dBA requirement is extremely quiet, and was a point of disagreement among even acousticians when the standard was being written. Principally it is a cost issue, of including the generous HVAC noise control necessary. Among other things it precludes the use of packaged thru-wall AC units, as often used in retrofit or in portable classrooms. The headline is that this prereq and credit should be easy wins for any school project with an acoustic consultant, who will be designing to these targets (or better) regardless of LEED status. Gifford is old news. Everything he criticizes has been thought of and in the pipeline. Including the concept of reporting, which was introduced in the LEED process in 2005, but it takes awhile to work things into the system. Balancing innovation & stability has been a key to success. Gandhi said: be 100 paces ahead of your followers and you'll be revered and called a visionary. Be 1000 paces ahead and you'll be stoned & called a heretic. On the SSc8 Light Pollution: There is also an allowance now for using the centerline of the public road as the site boundary for your end of drive light. This is a very welcome addition. Does anyone know if this was pulled from a CIR or what the likelyhood of getting credit reciprocity on a V2.2 project would be for this? I have a project with a dark/hidden entry and cannot achieve the credit without this clarification. Anyone knows about how to use the reginalization credits outside the US? Yes, outside! So far, regional credits are not available for international projects. Regarding international use and a few other issues, the USGBC has a list of frequently asked questions available here. the waste water issue (for areas of chemical mixing) in EQc5 used to appear in v2.0 and 2.1 then disappeared for v2.2. in the earlier versions you could be exempted for using green cleaning products. I wonder why this was resurrected? This was incredibly helpful, thank you! If you have a LEED-2009 Exemplary Performance list, please let me know. It amazes me that the USGBC continues to view natural resource regeneration rates in a bubble. Given the amount of processing (processing under zero labor regs mind you), the amount of chemicals and adhesives, the terrible life cycle performance, and the size 14 carbon footprint of products such as bamboo, it amazes me that people fall for this greenwashing.